Race the Sun is a procedurally-generated endless runner in which you take control of a solar-powered aircraft and fly it through increasingly difficult obstacle courses at what feels like increasingly ludicrous speeds, all while trying to keep pace with a slowly setting sun. It's simple but really quite good, in a 'shouting surprised obscenities as you smash into a wall' kind of way, and today—and only today—it's free. 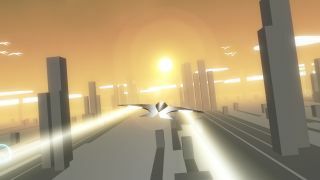 The freebie marks the release of Race the Sun on the App Store, although Aaron San Filippo, the co-founder of developer Flippfly, described it as a "crazy experiment" on Twitter. It also follows closely on the release of the Sunrise DLC, a "'zen' type mode" of play that eliminates the setting sun, increasing difficulty levels, and leaderboards. At the same time, the game was updated to add a first-person camera view and "High Scores in the Sky," which lets you literally fly past your friends' high scores. Race the Sun is free now and will remain so until 1 pm PDT on July 31, which is tomorrow. Grab it from Steam.